It needless to say, like their fine whiskey, the company has been making the finest barbecue sauces in the market. You can never go wrong with any sauce that has bourbon flavor infused in it. Each Jim Beam barbecue sauce adds the rich and delicate taste of bourbon to your grilled meats or seafood. This is literally one of the best sauces I ever tried in my life. You can try this sauce pretty much with anything. If you apply this with grilled or smoked chicken, God Lord, it would taste like heavens! Jim Beam Smoky Barrel sauce also adds extra flavor on steaks. It tastes great with pasta as well. The ingredients of this sauce make it America’s number one bourbon barbecue sauce. This sauce contains charcoal & chipotle, with the touch of molasses. It is consistency is medium. Highlighted features: Gluten-free, and smoky flavored sauce. Avery exclusive Southern-style sauce from Jim Beam. It’s both sweet and spicy. Jim Beam sauces don’t contain high fructose corn syrup or a ton of preservatives. This sauce is gluten free too. Its thickness level is medium. This sauce has a strong vinegar flavor but yet it tastes sweet. However, the sodium level of this sauce is a little higher. You can use this sauce with any Southern-style barbecue. It goes very well with chicken and oven baked items as well. As it has “Maple” in the name, it is obvious that it is a sweet flavored sauce. Flavor of bourbon and maple makes this sauce a great combination for chicken. You can use it to make pizza. You can infuse it into your roasted or fried turkeys, wings, hams, pork etc. The sauce is mainly made with real maple syrup, brown sugar, and various spices. It also contains tomato concentrate, pineapple, lemon juice concentrate, garlic, soybeans, and Jim Beam bourbon, among other ingredients. All natural sauce is also gluten-free and has nonalcoholic bourbon. You can store it in the refrigerator. Highlighted Features: Maple, Bourbon flavor. Tips: For better grilling you need a best quality smoker. We all know that homemade sauces are fresh and taste better. 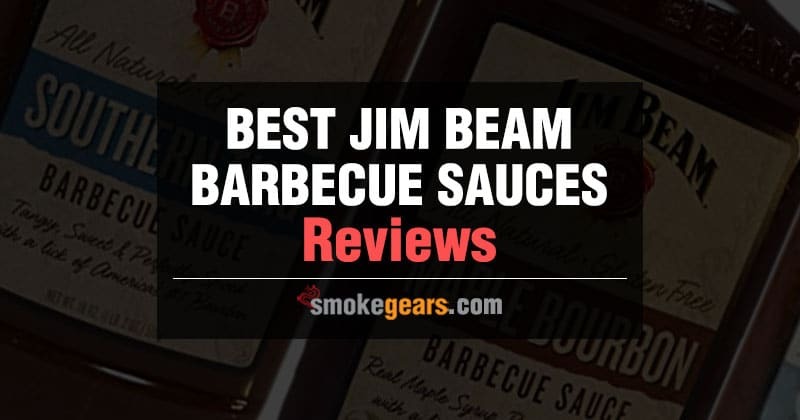 How cool it would be if you could make Jim Beam barbecue sauce at home? This recipe will guide you through to make original bourbon flavored barbecue sauce at home easily. For this recipe, you will require English mustard. You can get dry powder from the supermarket or local grocery store and then make the paste by adding water. Make sure to stir it well so that there are no lumps left. Next, you will have to refrigerate it for 30 minutes to rest. Now that English mustard is ready, you can get started with making the sauce. At first, get a big saucepan in order to prepare the sauce. Pour the ketchup in the pan and then gradually thicken the ketchup with the Jim Beam while stirring all the time. In this step, since the ketchup is diluted, now add the remaining ingredients, and bring to the boil. Stir gently. Now lower the heat and boil for about 20 minutes to achieve your required consistency of the sauce. Through this process, you will also be able to vaporize the bitter taste of alcohol (a bitter taste). This homemade Jim Beam barbecue sauce recipe is fresh and more natural than anything you can find in the supermarket. Tips: you need a thermometer to control cooking temperature for perfect grilling. You can grill or smoke the ribs, chicken or make burgers with any sauce. But choosing the right sauce is very important as it can make or break your dishes. Select your desired sauce from its numbers of variation, and be a pro in cooking while mastering the craft. Jim Beam is a trusted band which makes great sauces. Before, your next cook-out, you should really consider to try out their collection of barbecue sauces, if you haven’t already. I guarantee you, you won’t be disappointed. I personally prefer homemade sauce, but Jim Beam sauce gets the job done with authenticity.